THOMAS HEDGES:	On Saturday, candidates vying to be the next Chair of the Democratic National Committee, and effectively the party’s top fundraiser, met a final time in Baltimore, Maryland to address members and the public. About how to steer a party reeling from stunning defeats this November, in the elections for the House, Senate and White House. The contest to replace outgoing DNC Chair, Debbie Wasserman-Schultz, who resigned in disgrace last summer after a leaked email, showed how she used her position to undermine the Bernie Sanders campaign, has largely been narrowed to two out of the seven total candidates. Establishment favorite Tom Perez, who was Labor Secretary under Obama, and Congressman Keith Ellison, of Minnesota’s Fifth District, the first Muslim elected to Congress, who has been endorsed by Bernie Sanders. In many ways the contest is an off-spill of the Democratic Primaries between Hillary Clinton and Bernie Sanders, this time with the Bernie camp hoping to convince Democrats that a serious makeover for the Party is long overdue. WOMAN:	We need to organize our Party. We need to elect Democrats the way Keith did in Minnesota, and all across this country. THOMAS HEDGES:	Before the forum supporters of Congressman Keith Ellison staged a rally, to display to voting members that Ellison is connected to the grassroots movement. DEMONSTRATOR:	… we are the Democratic Party! We are the party of FDR, and LBJ, and MLK, and JFK! KEITH ELLISON:	I’m not really a Congressman. I’m an organizer who is a Congressman. And I’m going to tell you something, when Democrats lose elections, bad things happen to good people. The Republicans, and the rich folks, the top 1%, and again, there’s rich folks supporting us, now don’t get me wrong. You know, we don’t want to judge, right? It’s not everybody, but the Koch brother types. You know what I mean? You know they got a party. The Republican Party says we are for the rich people, period. End of conversation — and we’re going to discourage, divide and dis-unify, and deceive, in order to get them in power for what they want. The Democratic Party is the party of making a living for everybody. And I want you to know that I’m being sincere, I will fight for unity, every single day, because I know the part of what helps the other side beat us, is when we turn on each other. WOMAN:	I mean, when you hear him speak, you never feel like he’s a politician. You feel like he’s a community organizer. MAN:	I think that the Democratic Party is in disarray right now, with the results of this past election and without a dramatic shift, that I believe is necessary, that has to happen within the Democratic Party, we’re going to get the same type of results. You keep getting the same… you keep putting the same people in positions with the same viewpoints; we’re going to get the same results. WOMAN:	And I think that Keith Ellison is the real deal. Just like I felt Bernie was the real deal. He’s not a polished professional who can pivot. He is… he’s like Bernie. We need such strong reform. I’m not sure that Perez would be with that. THOMAS HEDGES:	While many, including the media, see Tom Perez as clearly the establishment’s choice, he’s been endorsed — by both Obama, and Joe Biden — he and his supporters don’t necessarily agree. WOMAN:	The notion that Tom is the non-progressive in the race is preposterous, quite frankly. He was a civil rights lawyer. He fought against police brutality. He fought for police department reform when he was heading the Civil Rights Division. In fact, Maryland’s first ever-living wage law was passed when he was the State Labor Secretary, and he was a huge champion for that. He stood with workers who are in the fight for $15 Movement when he was the U.S. Labor Secretary. MAN:	Where did he stand on TPP? WOMAN:	He supported the TPP as part of the administration. I know that’s one of the arguments that his opponents have tried to use against him, but he fought while he was in the administration to make sure that it was the most progressive trade agreement that it could be, and to make sure that there were really strong, and enforceable worker protections in it. THOMAS HEDGES:	Last week Tom Perez admitted to a group of lawmakers in Kansas, that the primary process was, “rigged”, against Bernie Sanders. But Perez quickly backtracked on his statement, taking to Twitter shortly afterwards, to explain to the public that he had, “misspoken”. As Labor Secretary, Perez advocated for raising the minimum wage. He also supported the TPP. In December of 2015, he endorsed Hillary Clinton, over Bernie Sanders. Ellison, on the other hand was one of Bernie Sanders earliest supporters, and has been opposed to neo-liberal policies, like the TPP; choosing instead to focus on issues like mass incarceration, and student debt. In November of last year, Senate Minority Leader Chuck Schumer, endorsed Keith Ellison. But on Saturday, those stark differences didn’t clash or play out. 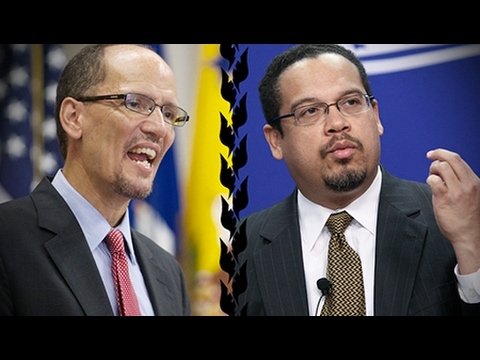 Ellison and Perez, along with their respective supporters, chose to put a message of politeness, over the question that underneath the surface is roiling the Democratic Party. KEITH ELLISON:	We’ve got to focus our energies on the basics, organizing, organizing, organizing. So, whatever it is you all need me to do, I will do it, because I am running. Because it is everybody’s job to make the American people know, deep in their hearts, that the Democratic Party is here to fight for them every single day. THOMAS HEDGES:	Clinton had pretty much twice as much money as Donald Trump did. THOMAS HEDGES:	How do you reconcile that? That, you know, the message of income equality, and the working class, and that the Democratic Party needs to become one thing, when in reality, money-wise it’s moving the other way? MAN:	Bill Clinton helped bring in more of Wall Street. But the reality is, that there’s now tension between the people’s wing of the Party, and the Wall Street wing of the Party. And at the end of the day, anybody in the Party needs to understand that the votes are always with the people. But the future is always with the people. THOMAS HEDGES:	If Ellison loses, I mean, at what point do you start considering whether you should work outside of the Democratic Party? MAN:	When Ellison wins, what you’ll see, is everybody who is in the Party, stay in the Party, but you’ll also see a lot more people come into the Party. And actually they’ve started a whole movement called “Dem Enter,” to start taking over city, county Democratic parties, and state Democratic parties. THOMAS HEDGES:	The February 24th election for DNC Chair has certainly been an opportunity for Sanders supporters to try, once more, to convince party elites that real change is needed within the Party. But at this weekend’s forum, the fact that Ellison supporters were reluctant to criticize Tom Perez, or even the interim Chair, Donna Brazile, who was caught passing along debate questions during the Democratic primaries to Hillary Clinton, suggests that an image of unity and consensus within the Party is more important than addressing a question that threatens to tear the Party apart. After all, the Chair’s main responsibility is not about representing the direction of the Party, it’s ultimately about raising money from the very Democrats who aren’t the ones who would like to see that kind of change.